This variable does almost as well as real disposable income in predicting election results. Of course, payroll growth and RDI growth are closely correlated, but this is nonetheless forces me to reevaluate my earlier claim that unemployment levels didn't really predict presidential election results. This measure also calls for some other reconsiderations if you buy the argument. For example, Gore did just about as well as could be expected, Stevenson massively underperformed in 1952 (thanks to the Korean War, five terms of Democratic control of the White House, and his relative lack of Ike-ness), and Nixon actually had a pretty solid economy in 1972. 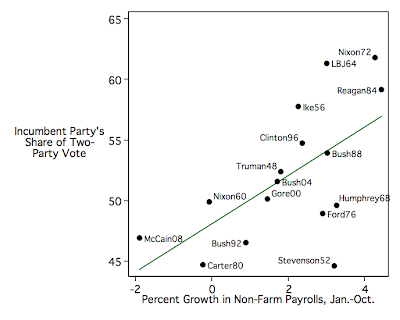 Oh, and McCain slightly over-performed in 2008, so cut him and Palin some slack. Or call the electorate racist. Whatever. Silver also comes up with a magic number for Obama: he needs 166,000 new jobs per month (a figure that was well exceeded in December and January).